Recently we've reviewed several 2-bay NASes targeted at the entry level market including the Western Digital My Cloud Mirror Gen 2 and, as part of a family review, the ASUSTOR AS1002T. 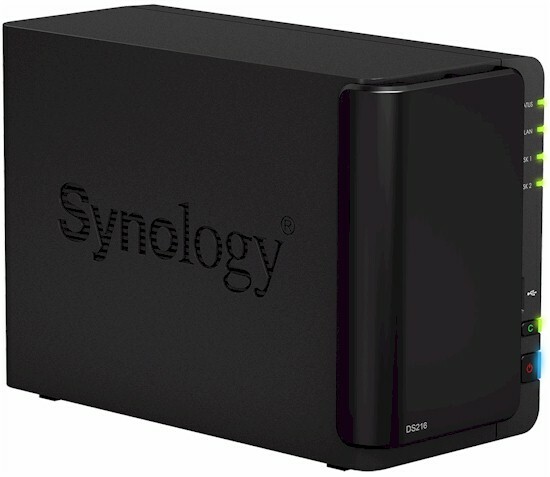 But it's been quite awhile since we've reviewed a 2-bay Synology. In fact, if you filter the NAS charts for the current testing method (black bars) and for 2 drives, the only Synology product that appears is Synology's new DS216 - the subject of this review. Throughout this review, I will be comparing the DS216 with WD My Cloud Mirror Gen 2 and the ASUSTOR AS1002T. All three NASes are targeted to the same entry level market, are based on the Marvell ARMADA 385 dual-core processor and have 512 MB of RAM. From time to time, I find that it's worth a reminder that the NAS Charts are a powerful product comparison tool. From the NAS Chart landing page, just select up to four NASes and click on "Features". The chart below shows a portion of the complete feature table if you select the DS216 and the other two NASes being used for comparison in this review. It shows that the three products are really more alike than different. The DS216 has its own Quick Installation Guide that includes step-by-step instructions for mounting disks into the disk trays, connecting the DS216 to power and LAN and configuring the NAS. After connecting to your DS216, a "first run" wizard walks you through the entire setup process. The Quick Installation Guide also provides rear and front panel callouts, shown below, as well as an LED Indicator Table found in Appendix B. We were unable to find an easy way to disassemble the DS216 without damaging it, so the components for the DS216 in the key component summary table below that are marked with a "(?)" are our best guess based on components used in similar Synology products.